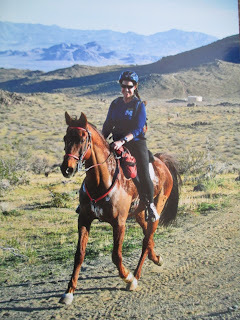 "Caartouche (Rio) and I were on the rider list to start Tevis again this year, 2015, but I had to cancel 3 days before the ride because bad re-shoeing 2+ weeks prior left Rio too sore to start. My farrier and I worked with it the best that we could, but the problem was not fixed. It is disappointing not to of attempted this challenging, beautiful trail. It was our goal for the year, and Rio and I were in excellent condition not just to start, but to finish as well. We had 100% completions on our AERC rides/races that we did prior to Tevis, with Rio finishing in the top 10 in 2 of our 3 competitions. Well, it could of been much worse. Rio's soreness was temporary. After successfully rehabbing Rio from two potential career ending injuries, this was a hiccup. Our next planned AERC competition was to be the third week of August: The Eastern Sierra Classic, which is located only 45 minutes from where I live, in Bridgeport, CA. We completed the LD distance in 2006 as our first AERC competition. We have finished the 50 mile distance 1 or 2 times. The ride was cancelled this year a week or so prior due to one of the many wildfires occurring in CA." I did not attend any more AERC competitions in 2015; instead, I enjoyed the beautiful trails in the Eastern Sierra where I live. On October 12th, I broke my ankle/acute sprain, which put a hitch in my getti-up. No surgery, but walking cast and non-weight bearing for a month and then physical therapy for 10 weeks. Luckily, two days prior I had moved Rio back to his winter home at Millpond Equestrian Center in Bishop, where I board him. It is a 75 mile roundtrip drive from where I live in Mammoth, so I normally have my trainer/friend, Rebecca, ride/condition/train him 2 times a week.